The Defender ends production in January, and a new family is expected in 2018. Land Rover will need it to appeal to a wider swath of buyers. LOS ANGELES -- Land Rover, a brand revered for its ability to climb over obstacles, has a new hurdle in front of it: how to bring its vaunted Defender nameplate into the 21st century. For 68 years, the old-school Defender has been at the heart of Land Rover's image as a posh-yet-rugged, go-anywhere brand. You're just as likely to see one on a safari in Kenya as you are parked at a Starbucks in Malibu. The Queen of England drives a Defender around one of her estates. But new-age concerns such as crash tests and fuel economy will force Land Rover to hit the reset button on its Defender family. The outgoing model ends production in January and hasn't been sold in the U.S. since 1997. Land Rover knows reinventing an icon won't be easy. "It is tough," Joe Eberhardt, CEO of Jaguar Land Rover North America, told Automotive News at last month's Los Angeles Auto Show. "Any replacement for an iconic vehicle is tough because the enthusiasts are certainly very vocal. They have an opinion on how to do it, but it's a huge opportunity at the same time." The new Defender family of vehicles is expected to break cover in 2018 in time for the 2019 model year. When it does, it will occupy the middle of Land Rover's three-level product lineup, with the uber-plush Range Rover line at the top and the Discovery line of practical people haulers encompassing the brand's most affordable offerings. 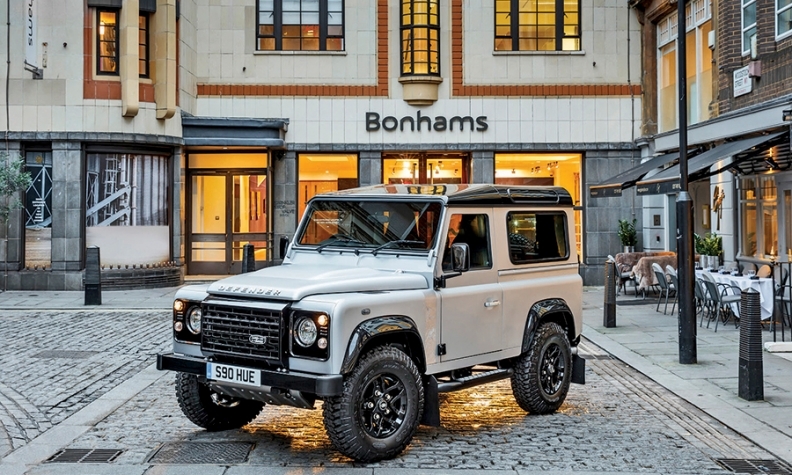 While the Defender range certainly will be the most rugged and capable line Land Rover sells, Land Rover also will need it to be a commercial success, even if that means diluting slightly the hard-core ethos of the outgoing model to appeal to a wider swath of buyers. "A lot of people love the idea of [the previous De-fender], but they never buy one," Gerry McGovern, Land Rover design director, told Automotive News. "While I'm a designer, and I love designing, I'm also a businessman. We need to build a critical mass in order to sustain ourselves in the long term and reinvest." That means selling 100,000 Defenders a year globally rather than 10,000 a year, McGovern said. The new Defender line is expected to comprise five models globally that echo the configuration of the previous generation: two two-door models; a longer-wheelbase four-door model that could seat up to eight; and two- and four-door pickup variants not expected in the U.S. The design of the new Defenders is under wraps. But the production models will look nothing like concepts Land Rover has shown in recent years. "When this vehicle comes out, people will know it's a Defender, it's a modern Defender," McGovern said. "But it will bear no resemblance to those Defender concepts." To be as successful as Land Rover wants them to be, the new Defenders will need to walk the line between hardy and approachable, much in the way Jeep has done with its Wrangler, said Ed Kim, vice president of industry analysis at AutoPacific. "I think Jeep has figured out a good balance of staying true to its heritage but building in just enough refinement and conveniences to live with on a daily basis," Kim said. "It's become a vehicle that can be a surrogate for a less hard-core SUV." They'll also need to be good enough for the queen.